Israel's police gave approval for a Gay Pride event in Jerusalem later this month, setting up a possibly violent confrontation between gay activists and ultra-Orthodox Jews. Police spokesman Micky Rosenfeld said the event will take place June 21, but it was not determined whether it will be a march. "There will be some kind of an event," he said, "either a parade or a gathering." Opponents of the Gay Pride event have already vowed to resist, saying open displays of homosexuality have no place in the city that is holy to Jews, Christians and Muslims. Last year ultra-Orthodox Jews rioted for more than a week after police approved a march in the center of the city. In the end, police confined the event to a soccer stadium to prevent clashes. An earlier march in Jerusalem resulted in violence when a protester stabbed three of the marchers in downtown Jerusalem. 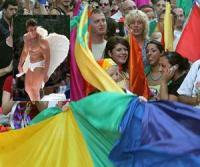 A yearly Gay Pride march in Tel Aviv usually proceeds without incident.